Care package chocolate is restricted to cold weather months. For military care packages headed to the Middle East or the Persian Gulf, that eliminates chocolate May through October! Plain chocolate cookies might travel well in warm weather, but not chocolate candy or cookies coated or topped with chocolate. 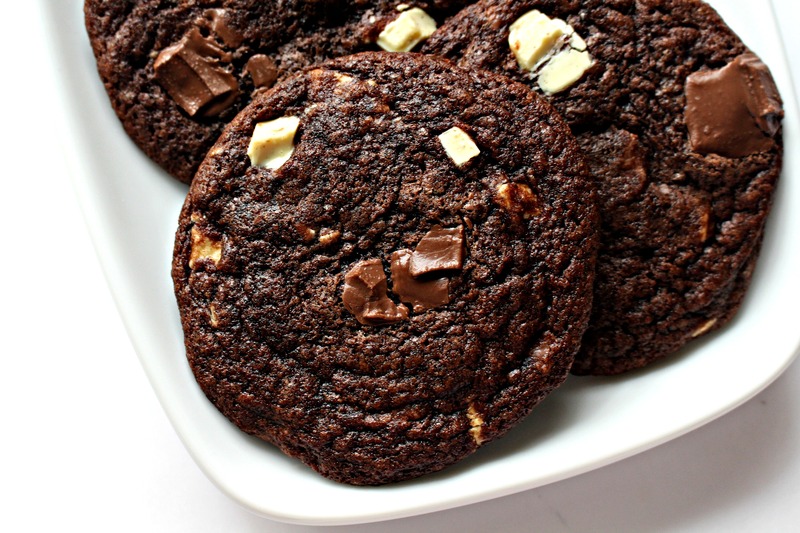 Chewy Chocolate Chunk Cookies are a recipe that celebrates the arrival of cooler weather. Now care packages, as well as cookie jars, can be filled with chocolate comfort! I was specifically searching for a super chocolaty recipe to share for the beginning of Chocolate Sending Season, when I found a chocolate cranberry spice cookie in “The Good Cookie” by Trish Boyle. It is my favorite cookie cookbook. The recipes always produce amazing results and there are many that stay fresh long enough to include in care packages. However, when I baked a batch, I was disappointed. I thought there was too much going on. Cranberries, spices, chocolate, and even nuts were included. I loved all of the ingredients and flavors, but not all together, all at once. The best part of the cookie was the rich, chocolate dough. For my Chewy Chocolate Chunk Cookies, I got rid of everything that wasn’t chocolate and added other ingredients that would emphasize the chocolate flavor. I am a fan of dark or milk chocolate mixed with white chocolate. I’ve used that combo in biscotti, bars, fudge. This time I combined the two chocolates in a cookie. The result is a chocolate dream. Tips for cookies that look as perfect as they taste: For cookies that are all the same size and shape, use a cookie scoop. The cookies will all contain the same amount of dough and will all cook evenly. If for some reason a cookie looks less that perfectly round, use the edge of a spatula to gently push the edges of the cookie into place immediately after removing from the oven, when it will be soft and pliable. For eye appeal, set aside some of the chocolate chunks. Instead of mixing the chunks into the dough, add a few on top of each cookie before baking. 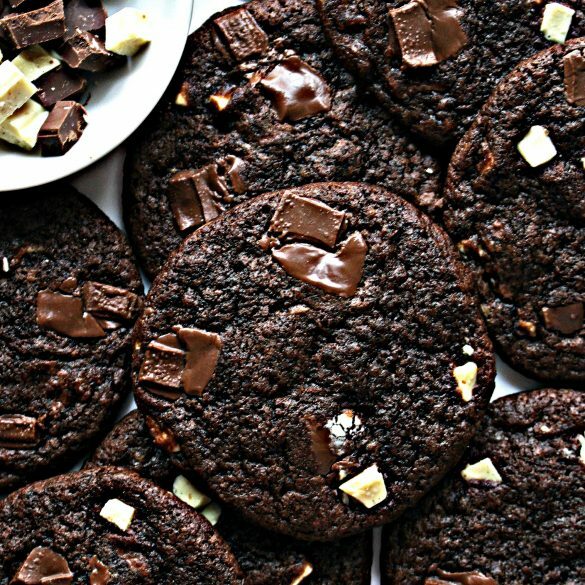 The flavor is exactly the same whether a chocolate chunk is inside the cookie or on top, but who can resist a cookie covered in pools of melted chocolate? Crispy on the edges and soft in the middle, Chewy Chocolate Chunk Cookies produce audible mmmmm’s from everyone that tries one. Bake a batch for your own chocolate celebration! In a medium mixing bowl, whisk together the flour, cocoa, baking soda, salt, and espresso powder. Set aside. In the bowl of an electric mixer, cream together the butter and sugars until light (about 3 minutes). Beat in the eggs, one at a time. Mix in the vanilla. Gradually add the flour mixture until just combined. 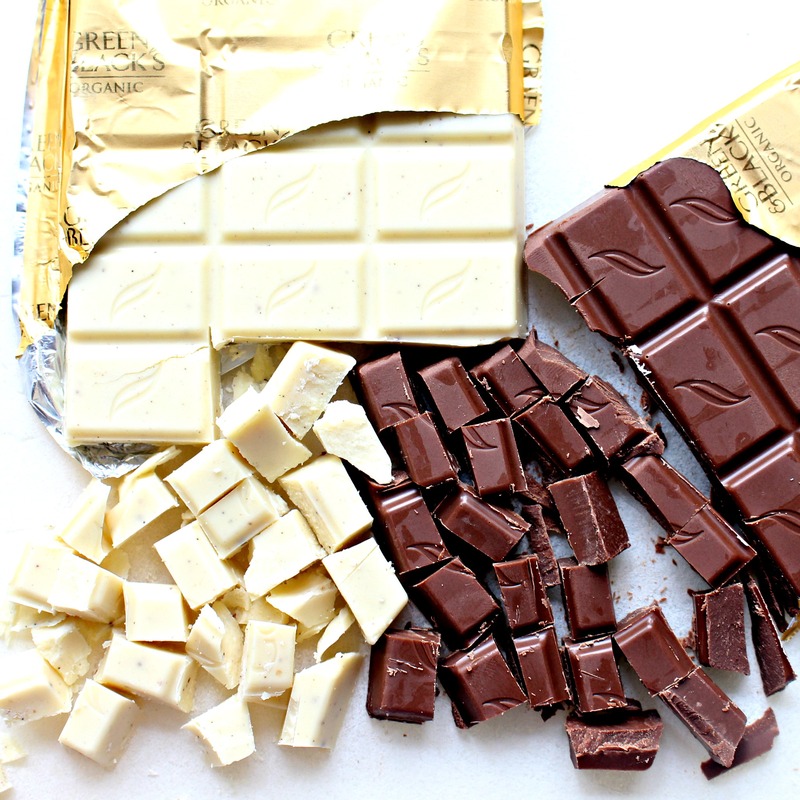 Set aside a small handful of the white and milk chocolate chunks for decorating. 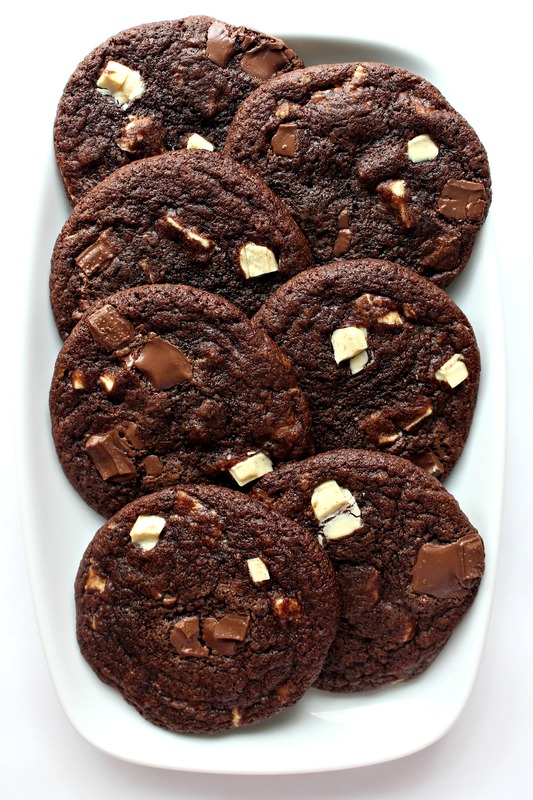 Fold the remaining chocolate chunks into the dough. Cover with plastic wrap and refrigerate to firm the dough, for at least 3 hours (up to 3 days). WHEN READY TO BAKE: Preheat oven to 350° F. Line a baking sheet with parchment paper. Using a medium (2 tablespoon) scoop, portion the dough into balls and place 2” apart on the prepared baking sheet. Gently press a few of the reserved chocolate chunks onto the top of each dough ball. Bake for about 11 minutes or until set. The cookies will still look a little wet and will be soft. Remove from the oven and allow the cookies to cool on the baking sheet for about 5 minutes before transferring them to a wire rack to cool completely. Once completely cool, store Chewy Chocolate Chunk Cookies at room temperature in an airtight container for up to 1 week. Double wrap pairs of cookies (with bottoms together) in plastic wrap, then place snugly in an airtight container or freezer weight ziplock bag. Wow! I know I would love these!! Thanks for sharing! Another amazing recipe! I just love what you do so much…….not only do you make delicious treats, but care packages are really priceless. These look so good and I love all the chocolate! Thank you, Sandra! These cookies are super chocolaty! They look so rich and chocolaty! Love, love love that you used 2 types of chocolate! Yay for chocolate season — I bet you’re going to have some very happy – and lucky – gift recipients. 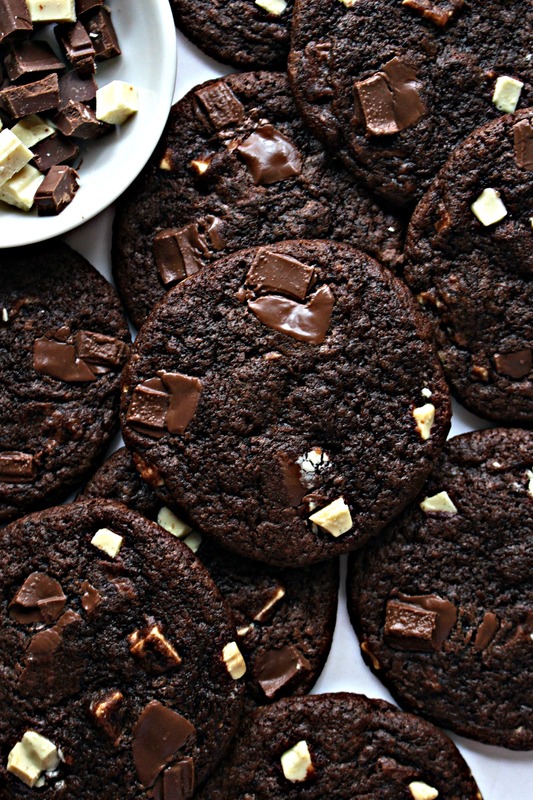 Your Chewy Chocolate Chunk Cookies look delicious! Your post is awesome and thanks so much for sharing it with us at Full Plate Thursday. Hope you have a great week and come back to see us real soon! I would love some chocolate nirvana in my life! 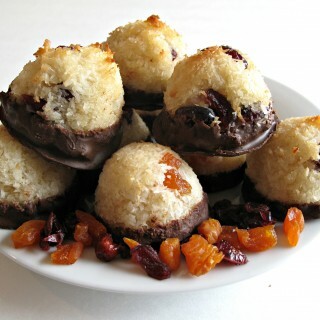 (Love that line btw) These cookies look irresistibly decadent. Absolutely love your tips on creating perfect looking cookies, as I always struggle with this; I always end up with a mighty tasty cookie, but it usually just looks like a plop, haha. I never knew you could still slightly shape them when they’re still warm out of the oven, definitely going to give that one a try. Thank you for all the tips, and especially for these heavenly cookies!